I’ve Triple-Checked The Math… I’ve Done 20 Stair Races! 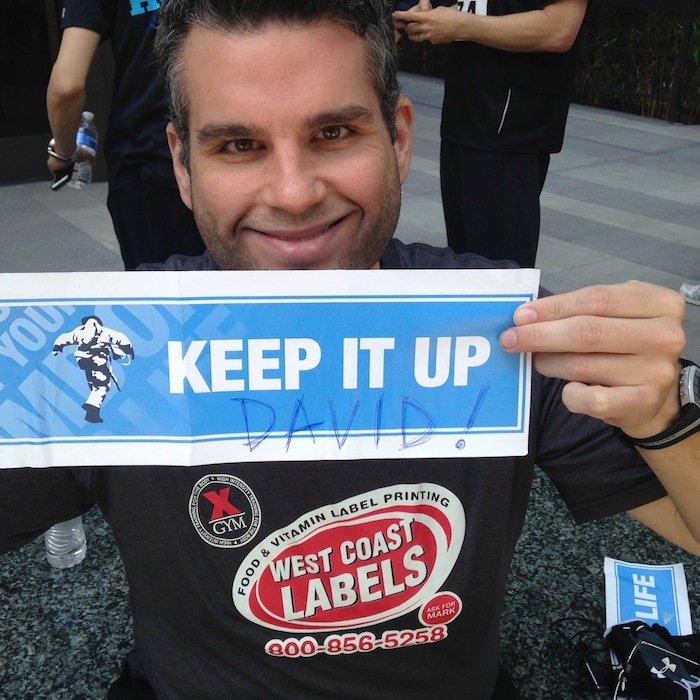 | Keep It Up, David! That wasn’t the only milestone I was celebrating. 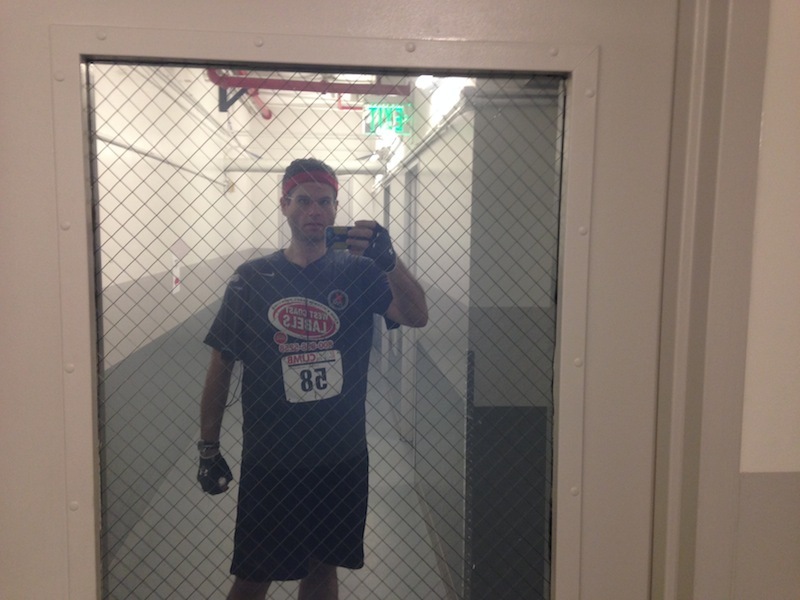 In addition, it was the three-year anniversary of my very first stair race, which was in the Aon Center in 2012. I remember how nervous and petrified I was going into that race, with no idea what to expect. I have vivid memories from that day, and it seems like it was ages ago. This was my fourth time racing in the Aon Center (check out my recaps from 2012, 2013, and 2014), and my goal was simple: set a new personal record by finishing in under 15 minutes, 14 seconds. I knew it would be hard work, especially given the struggles I’ve had while training, but I wasn’t a stranger to hard work, and plus, I went into this race with a different mindset (more on that later). I didn’t have time to dwell on my goal, though, because my morning wasn’t ideal. I got a late start leaving, then hit traffic heading downtown (only in LA are the freeways jammed at 8:30am on Saturday). I arrived at the building at 8:50am, which left me plenty of time before my 9:30am start time… until I learned at registration that I was actually in the 9am Elite group. Eek! I had just enough time to drop off my bag at gear check and get to the start line. Thankfully, they were running behind, and the 9am heat didn’t get started until about 9:20. I focusing on limbering up and stretching, and actually felt pretty good when it became my turn to enter the stairwell. The race itself went really well. I started out way too fast, which I do most of the time, but I found a good rhythm and pushed myself to keep going, as fast as possible. I stayed positive and encouraged myself, and didn’t let any thoughts of doubt permeate my brain. It was a grueling, exhausting climb, as they always are, but I was familiar with the stairwell, and that’s a big help. I trailed another climber for the final 15-20 floors, and on floor 58, I made a move to pass him. 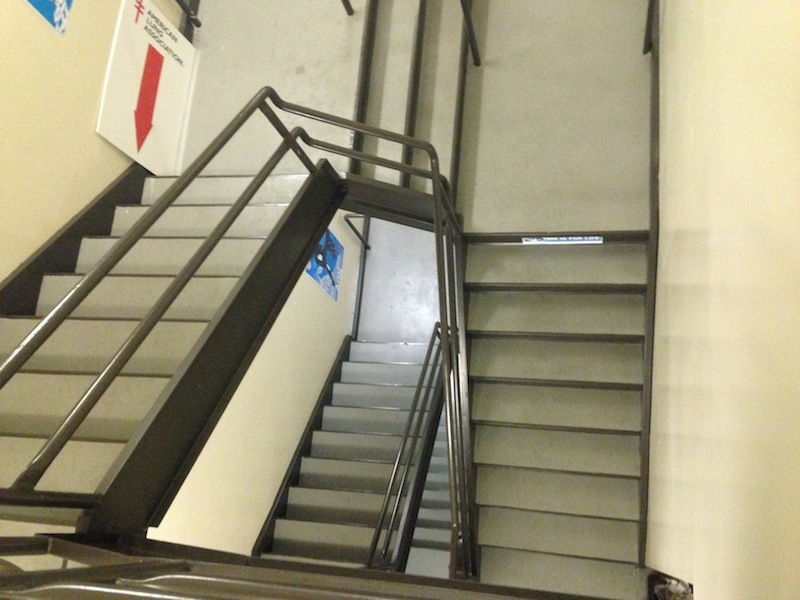 I tried to sustain that increased speed and sprint the final five floors, but I was wiped out. 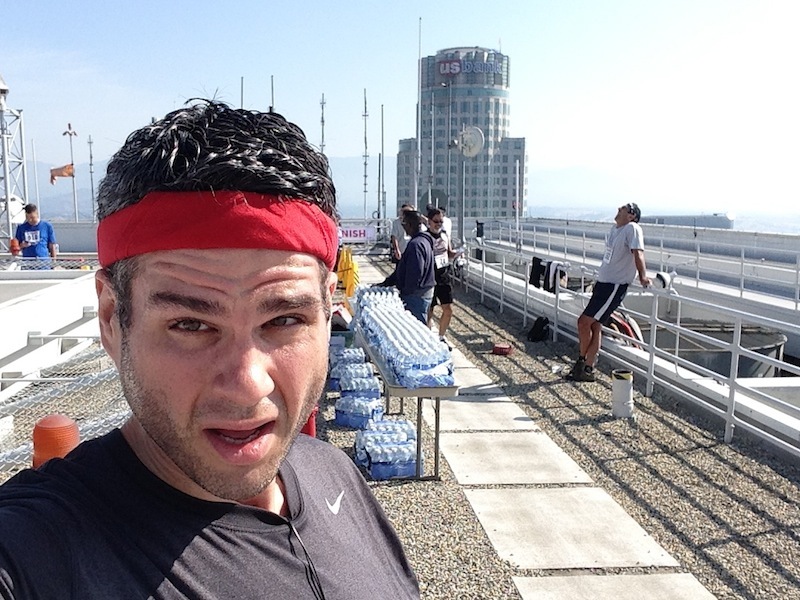 I crossed the finish line ahead of the other climber, practically stumbling onto the roof. I made my way off to the side, and collapsed onto the rooftop gravel. A medic gave me a cool, wet washcloth for my forehead. My heart was racing – I later learned that my average heart rate for the climb was 172, and my maximum was 184, beating the personal heart rate record I set in San Francisco a few weeks ago. But what I remember most, as I lay practically immobile, waiting for my heart to simmer down, was the sun, warming me, and how good it felt on my neck and arms. I laid in the sun for just a few minutes, but I wanted to stay there all day. I was so out of it that, on the way to the elevator, I saw myself in a mirrored door and thought it was someone else. 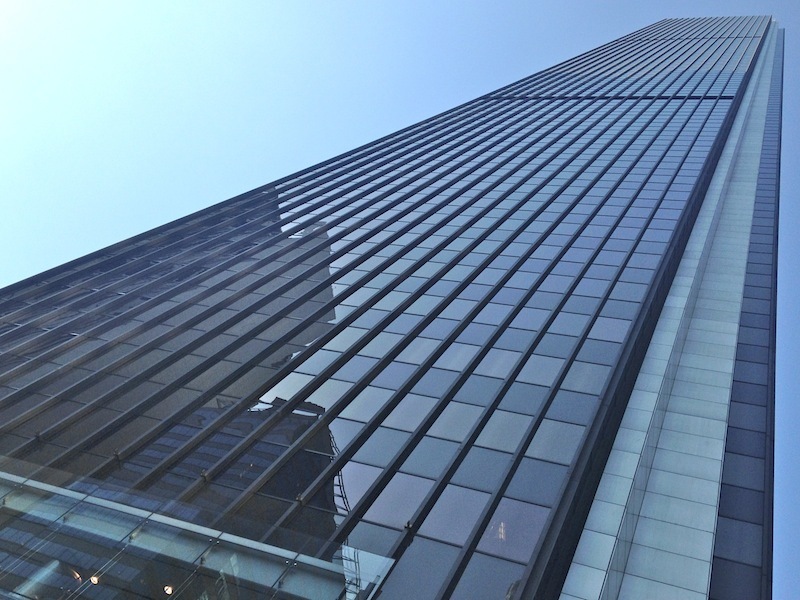 It took me SIXTEEN MINUTES AND TWENTY-NINE SECONDS to climb 1,393 steps to the top of a 63-story building! Sure, it was slower than last year’s time by over a minute, but I didn’t care. I knew I left everything I had in that stairwell, and that’s the most important thing. Plus, this race was so much bigger than just my time. It was my own celebration of all I’ve accomplished in the past three years, at 20 different races across the country. I know going in that this race was going to be more profound and more impactful than others. But I didn’t realize how much so until about an hour after the race, when I went back into the stairwell with a big group of friends for a second climb. 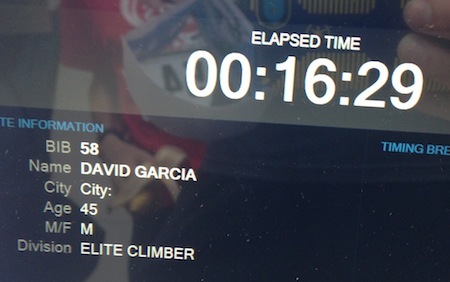 Since I had already done a timed ascent, this one was just for fun. I treated it very casually. But the others in the group were much, much faster than me (including five of the top ten fastest climbers that day), and by the fifth floor they were zooming off ahead, and that was fine. I had most of the stairwell to myself. I climbed steadily, but slowly. I enjoyed the solitude, took in my surroundings, exchanged pleasantries with the volunteers passing out water every dozen floors, and gave the few racers who passed me ample space. Most of all, I thought. I thought about how fortuitous it was to discover a sport that’s so terribly difficult and challenging, at a time when I was still discovering what I was physically capable of doing. I thought about the commitment it took for me to keep signing up for more races, again and again, and how I’ve never let myself give anything less than 100% on the stairs. I thought about how lucky I was to meet so many awesome pals through stair racing, so many of whom I now consider good friends and role models. I thought about all the sweat I’ve left in the stairwells (puddles of it) and the tears (puddles of those, too), and the mountains of anger, frustration, and stress that I’ve let go of while climbing. I thought about where I might be if I hadn’t found this sport. Would I have gained back the 160 pounds I’ve lost and kept off? I have no idea, and I’m glad that’s a question that will never have an answer. I thought about the pride that these events generate inside me, and how that pride floods my body and races down my limbs, until every inch of me is trembling with the knowledge that I have done something extraordinary. 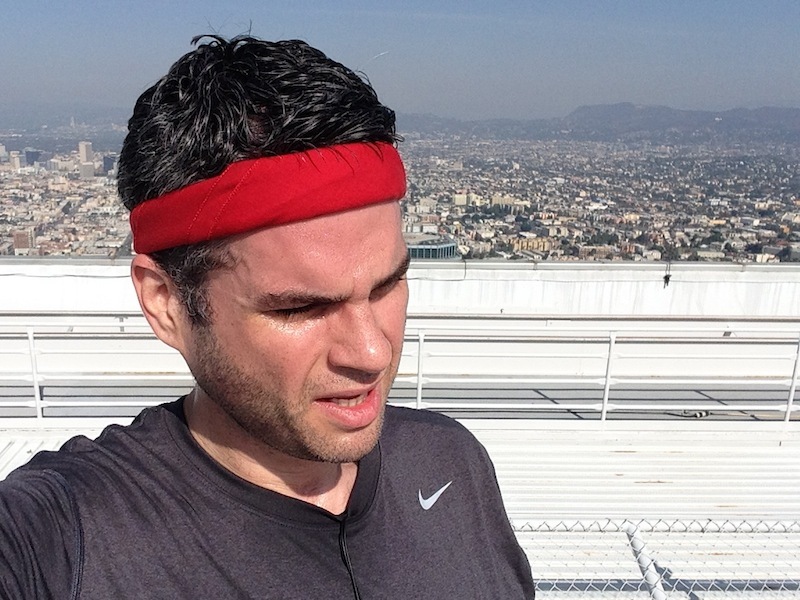 I thought about how strong I feel during a race, and how powerful it is to stand at the top of a skyscraper afterward, above an entire city, and how I’ve never felt invincible until I started climbing stairs. All these thoughts were swirling and circling during that second climb, but I specifically remember passing the 35th floor. I smiled, and felt my sweat and tears streaking down my face. I knew I had I come a long way, but that the stairwell continued for quite a distance. So I continued, onward and upward, stair after stair, climbing towards the sun. I stole this sign from the stairwell… and only had to modify it slightly! A heartfelt thank you to my donors for this race: Justin and Sarah, Kristy and Mike, Joanne and Joe, Anita and Gerry. Your donations to the American Lung Association were very kind and generous, and I’m grateful to have you all in my life. This entry was posted on Monday, April 13th, 2015 at 2:31 am and is filed under Uncategorized. You can follow any responses to this entry through the RSS 2.0 feed. You can leave a response, or trackback from your own site. 6 Responses to I’ve Triple-Checked The Math… I’ve Done 20 Stair Races! Wow, what an accomplishment! Those roof tops really make for a great motivator, I bet. Great smile with your sign. Thank you! Yea, it’s a bummer that the races we did together didn’t end on the roof. It’s the best.